by Victor Afanasiev- 833 pgs. 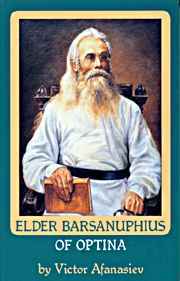 A refreshing biography of one of the 14 great Optina Elders whose teaching, spiritual foresight, and clairvoyance pierced the mysteries of God as they related to those they met or corresponded with. This elder was a colonel in the Russian Army before his call to monastic life at 47, and shows in particular in its telling that the circumstances of our life are never by chance and have a most deep meaning that we can learn. The life of one of the later of the 14 great elders and spiritual guides from Optina Monastery (+1912), this is the next in the series about what spiritual power and blessing came out to the world from Christ through their hands. This elder had left the world as a Colonel in the Imperial Russian Army, and became later the Abbot of Optina, but learned the depth of humility and meekness of heart after being deeply touched by his spiritual guides, the previous elders of Optina.